With Double roller banners you will grab twice as much attention and you can have a different design on each banner. The Double roller banners of 85x200cm are provided with sharp picture quality banner material (PVC). Taking your roller banner on the road? Receive a free carrying bag for convenient transportation! 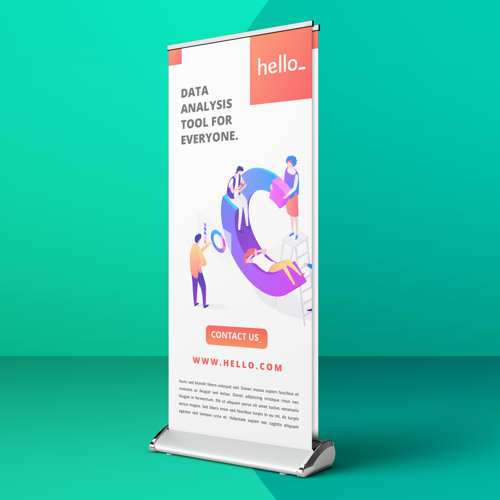 Order high quality Double roller banners from Helloprint today! A bit late, no problem! Fast delivery is possible. Keep 150 mm safety margin from the bottom. For a roll-up banner, we use different safety margins per side. Please use the following safety margins: Top 10 mm, Left 4 mm, Right 4mm and the bottom 150 mm. The bottom part will mostly be covered by the roll-up banner stand and will not be visible. Roll-up banners are one of our most sold products and are very popular for promotional purposes. 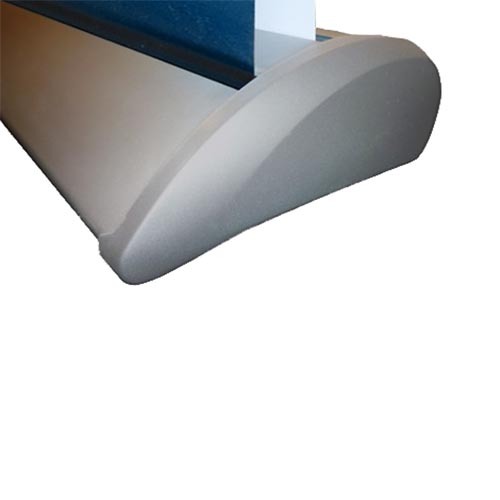 A roll-up banner is a PVC material with your design printed on it, put into a spring mounted rolling system. 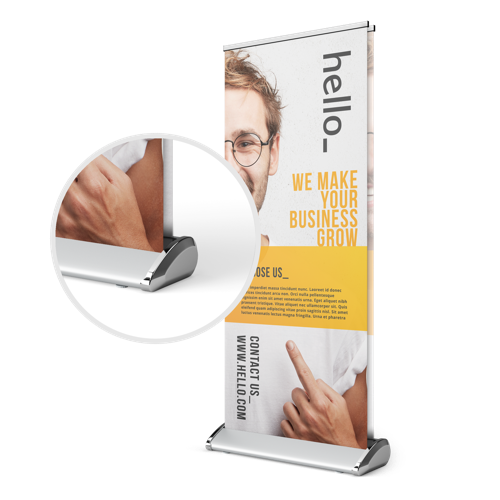 The roll-up banner can be set up vertically by pulling it out of the rolling system and mounting it with the supporting pole to hold it up. This is the ideal product for promotion because of it's size and visibility. For the delivery of your double roller banners we use multiple carriers. Because of the highest reliability, in most cases we use UPS or DPD. The double roller banners that is chosen in most cases can be selected via our website. Are double roller banners fit for usage outside? All of our roll-up banners are mainly suitable for inside use. The lifetime of the banners are definitely influenced by outside use and not recommended for this. Sharp picture quality: This 'sharp picture quality' 210mu is a matt white polyester film with a satin coating on the front and with a silver back so that the material is completely opaque and is not translucent. The double roll-up banner has 170mu material, similar to the 210mu quality but more suitable for a double roll-up banner. What base does the Double roller banners have? Double foot: This model is similar to the deluxe model. Only suitable for double roll-up banner. The model immediately strikes the eye by the unique look and the double facing banner. With the double roll-up banner you have a lot more perspective and impact. 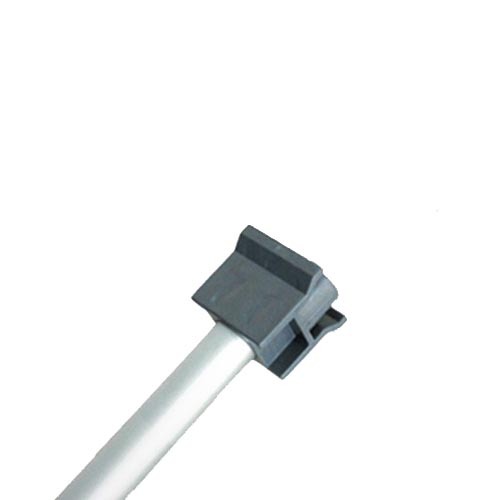 The weight of roll-up banners with a double foot is around 8.3 kg. This foot is only suitable for sharp photo canvas. This is because the standard banner material is too thick for the slot of the foot. The standard banner material can cause problems when rolling in and out. Can I change the canvas of the roll-up banner? It is possible to change the canvas of your roll-up banner. Note: You need certain knowledge of the product to do this yourself. The rolling system on the bottom has high resistance so please do not change it without having knowledge about the product. Ordering the canvas alone (without the stand) can be done by ordering banners..
Is it possible to have 2 different designs when ordering a double roll-up banner? Yes, this is possible. You will have to supply 2 different design files when this is your prefered option.